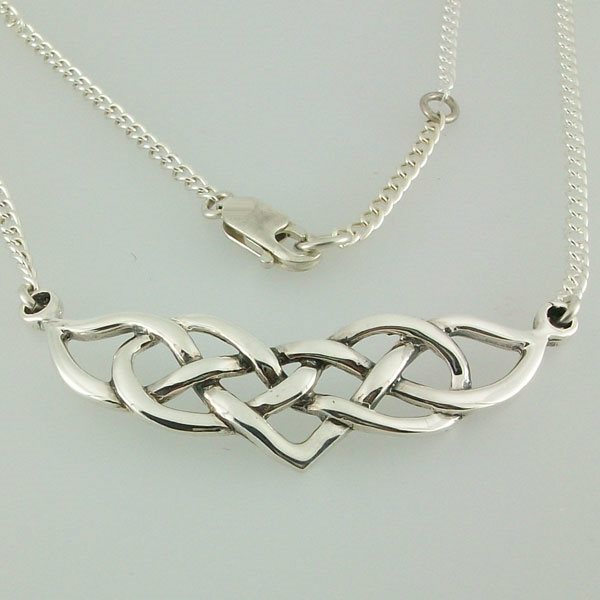 Stunning celtic design sterling silver necklace. Named after Soay the isle is north west of Hirta which is renowned for its native sheep. This Soay Necklace is 415mm (16") in length and the charm is 54mm . Approximate weight in silver is 9.2g. Ordered late Thursday afternoon, delivered Saturday morning so well impressed with that. This is a lovely and quite substantial piece of jewellery, by no means heavy but not flimsy either. As my title says, this is a quality product. Having had the pleasure of calling into the shop in May during a trip from Lewis to Barra, I'm sure my wife will love her Xmas present and want to return to add to her jewellery collection. Reviewed by J Forster - Hants, UK. This has been admired by so many people since I bought it a couple of weeks ago. Celtic designs are widespread nowadays, but the clarity and simplicity of this one make it stand out.